At The Snüz Family, the safety and product experience of our customers and their families is at the centre of everything we do. Our policy and promise to you is that through continuous testing, feedback and analysis, we continually improve and develop our products. Because of this we have set up this section on our website dedicated to notifying customers of any upgrades or improvements we are rolling out on our products. We'd also love to hear any feedback you have or suggestions of how we can improve. Please email us at hello@snuz.co.uk with your suggestions and the relevant department will be notified! As part of our promise, we have identified that an improvement could be made to the Stand Brace of a specific batch of SnüzPod¹ (produced December 2013-October 2014) - LGS1301. 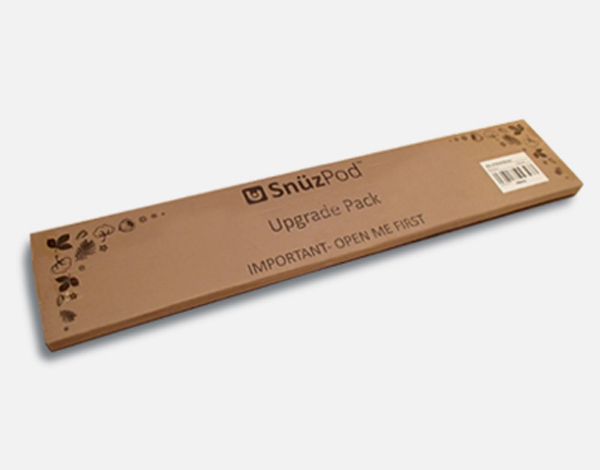 We are delighted to offer an upgrade pack to existing customers free of charge, which allows them to benefit from the key change, ensuring all SnüzPod customers have only the very best experience with the product. The pack takes 5 minutes to swap on to your crib and will ensure the product's durability, ease of assembly and continued use. Free packs will be delivered... working days of being ordered. To find out if your crib has the upgrade already, or to order your free pack, please click the ‘more' button below.